The steps we're taking to address climate change not only reduce our environmental footprint, they also help ensure the supply of high-quality coffee that our customers expect from us is sustainable for future generations. Given that our agronomists, quality experts and buyers are on the ground working with coffee farmers every day, we see firsthand and hear directly about the impacts of climate change. In addition to increased erosion and infestation by pests and coffee rust, coffee farmers are reporting shifts in rainfall and harvest patterns that are hurting their communities and shrinking the available usable land in coffee regions around the world. The potential impact of climate change on farming communities is a key reason addressing our environmental impact is a priority for Starbucks. We believe now is the time to increase our investments in solutions and strategies – both in our stores and at the farm level – that help tackle this crisis. 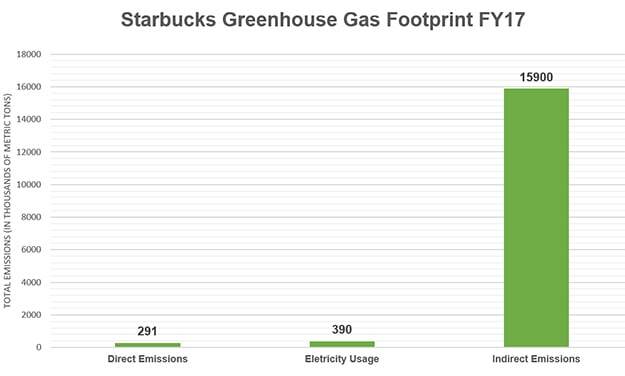 Starbucks has been implementing a climate change strategy since 2004, focusing on renewable energy, energy conservation, climate adaptation and mitigation efforts. In our stores, we have focused on building to LEED® standards while also becoming one of the largest purchasers of renewable energy in our sector. To build upon this work, we announced in 2018 a commitment to not only design, build and renovate, but also operate 10,000 greener stores globally. At the farm level, we have worked with Conservation International to include climate-smart agricultural practices as part of Coffee and Farmer Equity (C.A.F.E.) Practices, our ethical coffee buying guidelines. We’re also committed to championing progressive climate change policy in partnership with other businesses and organizations. We are a signatory to RE100, the global corporate commitment to purchasing 100% renewable energy, as well as the Corporate Renewable Energy Buyer’s Principles. To continue to track and quantify our own environmental footprint, we conduct a yearly inventory of our greenhouse gas (GHG) emissions. Using the World Resources Institute/WBCSD Greenhouse Gas Protocol, we evaluated the major emissions from our global retail stores, manufacturing operations and purchased goods and services. The 2017 inventory found our Scope 1, Scope 2 and Scope 3 emissions were 16,581,000 metric tons of carbon dioxide equivalent. According to the Protocol, Scope 1 includes direct GHG emissions from sources that are owned or controlled by the company. For Starbucks these include manufacturing plants, store operations, and company-owned vehicles and aircraft. Scope 2 includes market-based electricity emissions from the generation of purchased electricity consumed by the company. Through the purchase of Renewable Energy Credits (RECs) we are able to offset 62% of our store emissions globally. Scope 3 emissions is the largest component to our footprint. It includes purchased goods and services, as well as, emissions from our licensees and partnerships. The leading contributors for Starbucks are food, dairy, coffee and packaging.